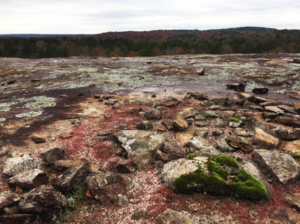 The lunar landscapes of Arabia Mountain and Panola Mountain, as well as the lush forests and meadows found throughout the Arabia Mountain National Heritage Area (AMNHA), cry out to be photographed. But we want to leave no trace and keep these wild spaces beautiful for future visitors when we’re getting that perfect shot. Here’s how to catch the great photos you want while preserving the nature that makes the Arabia Mountain National Heritage Area (AMNHA) so special. 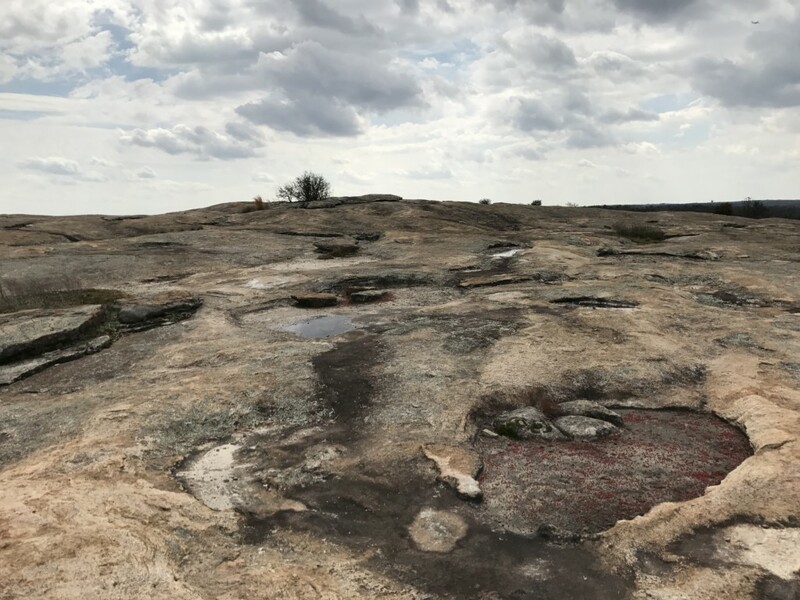 If you’re taking photos within the Davidson-Arabia Mountain Nature Preserve, there are several spots where you can get out on the rocks, including on Arabia Mountain itself and on the mile rock trail (see trail maps here). For any commercial film or photography, no matter how large or small, contact the park rangers at (770-484-3060). The rangers will be able to assist you. These rules apply to everyone – hikers, amateur photographers and professionals alike: No activity is permitted through puddles, wetlands, and areas where water collects. Removal, cutting, driving on, parking on, walking on and any disturbance of plant and animal life is prohibited. This includes shallow gravel dishes, rock piles, mounds, pools of water, and anywhere plants are present (in practice, that means avoiding anything green or red). Activity is restricted to bare rock only – aka Stay On The Gray. These rules apply to all park visitors – commercial and amateur photographers alike. Innocuous pools of water – no matter how large or small – are an essential part of life for plants and animals. Do not disturb these habitats. For those interested in using Arabia Mountain for filming: Preserve staff will direct and locate corridors of travel from the Quarry office to filming location. 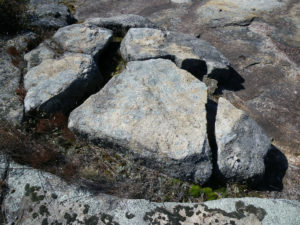 All activity must take place on bare rock surfaces. Cars and trucks have limited access to the PATH only, no trailers on the PATH. Carts and ATV’s are permitted on PATH and outcrop. We ask that you commit to leaving the least amount of impact possible. 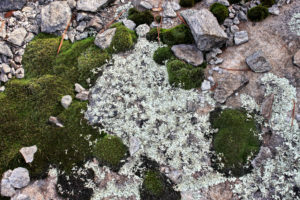 Two patches of life on the rock face – one in the bottom left, nestled between several larger rocks, and one on the top righthand corner, a small sandy patch. Note that small patches of gravel on the rock face are the beginnings of future soil and greenery. Photo credit William Bishop. Panola Mountain is a National Natural Landmark and the first conservation park in the state of Georgia. As a result, access to the mountain is much more limited than it is at other sites. If you have questions about commercial photography, or if you just want to take a guided hike, call park rangers at (770-389-7801). Solution pit with diamorpha and moss growing. Note the piles of loose rocks and gravel: even when no vegetation is in sight, keep an eye out and avoid these patches of soil. Located off of Klondike Road and managed by Panola Mountain State Park, Vaughters’ Farm represents one of the last dairy landscapes in DeKalb County, once the largest dairy producer in the state of Georgia. Vaughters’ barn, recently renovated to ensure structural stability, is a popular site for photos. 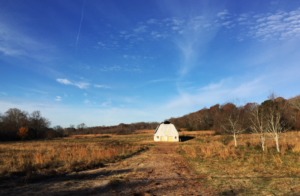 Similarly, the meadow loop trail is one of the few places in metro Atlanta to see the Eastern meadowlark, an iconic grassland bird with a beautiful song. Are you a professional photographer? All commercial photographers must receive permission from Panola Mountain State Park before a photoshoot (note that this includes student video shoots). For any commercial film or photography, contact the park rangers at (770-389-7801). These measures are taken to ensure that this historic barn and biodiverse fields are preserved for future visitors – and wildlife – to enjoy. Lichen takes years, or in some cases centuries, to grow. Take care to not touch or step on this key player in the ecosystem of the rock outcrop. Photo credit William Bishop. Do you just enjoy taking photos? Like other parts of the AMNHA, remember to leave no trace, be careful not to disturb wildlife or wildlife habitat, and most of all enjoy this vibrant, beautiful place with respect. Lastly, under NO circumstances do ANY park units allow for smoke bombs, glitter, firecrackers, strobe lights, fire or any other disturbance as part of a photoshoot. Anything that would cause a disturbance to passing drivers or otherwise harm the environment is strictly prohibited. Our utmost responsibility is the care of these natural areas and safety to park visitors and we ask that you do not participate in any activity that could harm wildlife or people. With that in mind, go on out and take some great photos! We can’t wait to see what you find out there – and remember, when hiking on the mountains, stay on the gray.